Apple TV 4K is up-to-date to stream 4K and HDR content now, which is trying to do more than just provide you with a gadget that can stream Netflix or iTunes Store movies in 4K. For Blu-ray fans, have you ever thought about to stream and watch 4K/108P Blu-ray movies on Apple TV 4K? If you, you’re in the right place. In this post, we aims at providing the best way to watch Blu-ray movies on Apple TV 4K. To save your time, I suggest you use the all-in-one and best Blu-ray to Apple TV 4K converter: Brorsoft Blu-ray Ripper for Mac.With it, you can fast rip/convert any (protected) Blu-ray/DVD movies to Apple TV 4K compatible H.264/H.265 MP4, MOV, M4V, etc. formats in ultra fast speed and excellent quality. Besides, this professional yet easy-to use Blu-ray ripping tool also enable you backup Blu-ray/DVD movies in two options: copy entire Blu-ray/DVD discs in original structure, directly copy Blu-ray/DVD main title movies. For Windows users, please turn to Brorsoft Blu-ray Ripper for Windows. Install and launch the best Blu-ray to Apple TV 4K converter and click “load disc” button to load your 4K Blu-ray movies to this program. Simple click Format button to choose a proper format i.g. 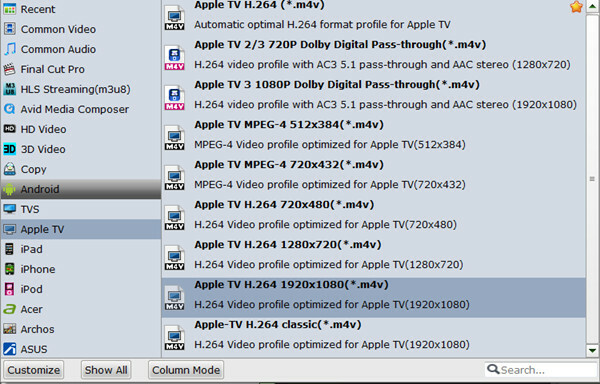 Apple TV H.264 1920*1080(*.m4v) from Apple TV category as the target format. Or you can choose H.264 MP4, MOV, M4V, H.265 MP4 in Common Video or HD Video category as well. Tips: Click the “Settings” icon and you will go into a new interface named “Profile Settings”. You can adjust codec, aspect ratio, bit rate, frame rate, sample rate and audio channel, etc. Afterwards, tap the Open button to quickly locate the ripped files. Then, import them to iTunes, or Plex Media Server for streaming and watch the converted Blu-ray movies on Apple TV 4K without hassle. This entry was posted in Blu-ray, Feature Post and tagged best blu-ray to apple tv 4k converter, convert blu-ray to apple tv 4k, rip blu-ray to apple tv 4k, stream blu-ray movies to apple tv 4k, watch blu-ray movies on apple tv 4k. Bookmark the permalink.